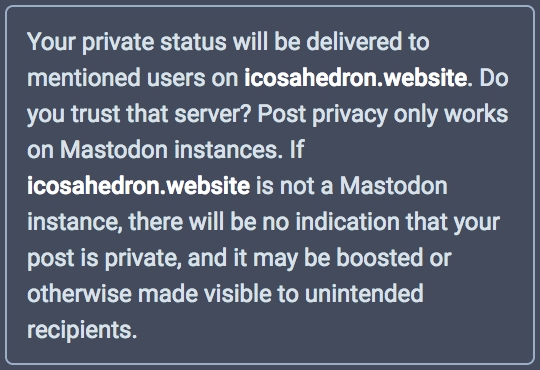 In version 1.3 of the Mastodon software, the Mastodon development team made changes to how post privacy settings work—particularly, with respect to the private post setting. In this post, we'll take an in-depth look at Mastodon's privacy features, and answer a few common questions about the change. Okay, so, give me a recap. How do Mastodon's privacy settings work? Something you may not know about Mastodon's privacy settings is that they are recommendations, not demands. This means that it is up to each individual server whether or not it chooses to enforce them. For example, you may mark your post with unlisted, which indicates that servers shouldn't display the post on their global timelines, but servers which don't implement the unlisted privacy setting still can (and do). Servers don't necessarily disregard Mastodon's privacy settings for malicious reasons. Mastodon's privacy settings aren't a part of the original OStatus protocol, and servers which don't run a recent version of the Mastodon software simply aren't configured to recognize them. This means that unlisted, private, or even direct posts may end up in places you didn't expect on one of these servers—like in the public timeline, or a user's reblogs. It is important to note that regardless of your post's privacy settings, server administrators can still read every post you send out. You should only ever post personal or confidential information on instances whose administrators you trust. Wait, so you're telling me that my “private posts” weren't really all that private?? Sort of. Mastodon can't force a server to respect its privacy settings, but it can control which servers have access to its posts. Before the 1.3 update, Mastodon servers avoided the problem of other servers not respecting their privacy settings by simply not sharing their private posts. This lengthy explanation is Mastodon's complicated way of saying We have no control what happens to this post once it leaves our servers. Not sharing private posts with other servers worked back when most Mastodon users were all on mastodon.social, but now that there are over 1000 Mastodon instances, most users have friends and followers on a wide variety of servers. Many of these users complained about not being able to see their friends' private posts because they weren't federating. In an attempt to fix this problem, as of the 1.3 update, Mastodon now will share your private posts with every server that follows you, regardless of whether or not that server supports privacy settings. The name of “private posts” has also changed to “followers-only” in the user interface to indicate that these posts are no longer truly private. This change has fixed things so that followers on other instances can now see your private posts, but it also creates a problem where, if their server doesn't support Mastodon's privacy settings, that post may not appear to them as “private”. Consequently, your private posts may show up on their public timelines and receive replies and reblogs from complete strangers. This will remove any followers from the instances you select, but it will also make you unfollow everyone on those same instances. This is because this feature actually works by blocking and then unblocking all of the users on the instances you provide. If your account isn't locked, there is nothing to stop the users removed by this feature from immediately re-following you and regaining access to your posts. This still sounds like a bad idea. It was proposed that users should be allowed to opt in or out of this new behavior through user settings, although at the moment this hasn't been implemented. If Mastodon allowed users to whitelist only select instances (such that users from other instances were blocked), they could limit their followers to only those instances that they knew supported Mastodon's privacy settings without locking their account. However, users from other instances still wouldn't be able to see their posts. Instead of making private posts that are sent to all of your followers, Mastodon lists would allow you to send posts only to the subset whose servers you knew would respect your privacy. Communicating to the development staff that these features are important to you is the best way to ensure they are made priorities and quickly implemented. The current project manager for Mastodon is @maloki@mastodon.social, and you can (respectfully!) contact her with any questions you have about these new features. Published 27 April 2017 by ALLIE ❤ HART.